(June 04, 2014 – Press release) – Since its inception, Vegas Partner Lounge (VPL) has strived to be at the cutting edge of online gaming technology. With mobile devices central to everyday life and all forms of entertainment, the next two VPL casino brands are going mobile. On Wednesday 4th June 2014, Maple Casino and Casino-Mate will launch their mobile casinos so that players can enjoy their on-the-go gaming anywhere, anytime. Maple Casino Mobile :: NEW mobile casino – PLAY NOW! And any new brand launch brings with it a set of exciting New Offers! Maple Mobile Casino will offer a generous 3-Tier Deposit Bonus when they sign up. 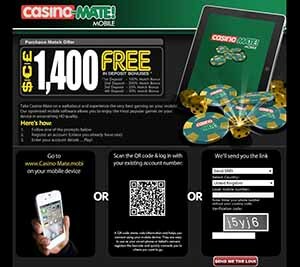 Casino-Mate Mobile has an exceptional 4 – Tier Deposit Bonus offer to players when they sign up. This warm welcome means that they’ll have even more opportunity to experience top-notch mobile gaming. When players sign up at Casino-Mate they will receive up to $/€/£1400 Free. Their first deposit is matched 100% up to $/€/£100, their second is matched 200% up to $/€/£50, their third deposit is matched 25% up to $/€/£500. The fourth deposit is matched 50% up to $/€/£750. 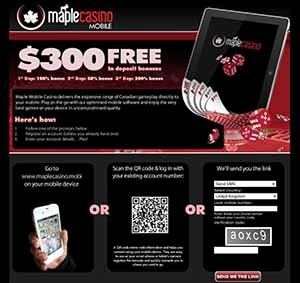 Maple Casino players can expect up to $/€/£300 Free over their first three deposits when they sign up to play. Their first deposit is matched 100% up to $/€/£100, their second is matched 50% up to $/€/£100, and their third deposit is matched 200% up to $/€/£100. Casino-Mate Mobile :: NEW mobile casino – PLAY NOW! VPL casinos use Microgaming™ as their sole gaming software provider so smooth and seamless gameplay is guaranteed. Both new mobile casinos can be played on all major devices such as iPhone, iPad, BlackBerry, and Android – with the advanced mobile auto-detect system, players will be directed to a platform that suits their device. These new mobile casinos will also offer the same great service VPL players have come to expect. Banking is secure and hassle-free, promotions and offers are fresh and exciting, and there is a multilingual Contact Centre available 24/7 to assist with any queries or concerns. Maple Mobile and Casino-Mate Mobile are set to provide the most enhanced, realistic and user-friendly mobile gaming around! Vegas Partner Lounge (VPL) is a gaming group that has been around for over 12 years and hosts some of the most prestigious casinos in the online environment. Brands within the VPL Group include: Crazy Vegas Casino, Crazy Vegas Mobile, Casino UK, Casino UK Mobile, Golden Riviera Casino, Golden Riviera Mobile, Sun Vegas Casino, River Nile Casino, 777 Dragon Casino, Cinema Casino, Maple Casino and Casino-Mate. And now it includes Maple Mobile and Casino-Mate Mobile. ← Take it to the next level with Crazy Vegas Casino’s newest Video Slot: Terminator 2™ – You can Win the Maximum Jackpot of £88000!